So the show is over for another year and a good time was held by all. The Royal Show in Adelaide has been held since 1840 which incredibly was only 4 years after the South Australia’s settlement which occurred in 1836. Early on the show was mainly produce based and featured potatoes, onions, the different grains such as maize, wheat, oats and barley, and cheeses. 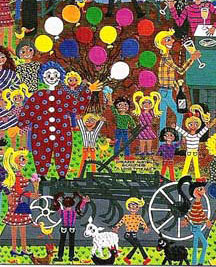 Then they combined it with the Livestock Show and added cows, horses, sheep, pigs and fowl. Although in those days they did not have all the fancy equipment to sow and harvest as my painting below shows. The first show was held in the yard of the Fordham Hotel in Greenfell Street then moved to the Botanic Park and later on in 1925 to Wayville showground where it is still today. 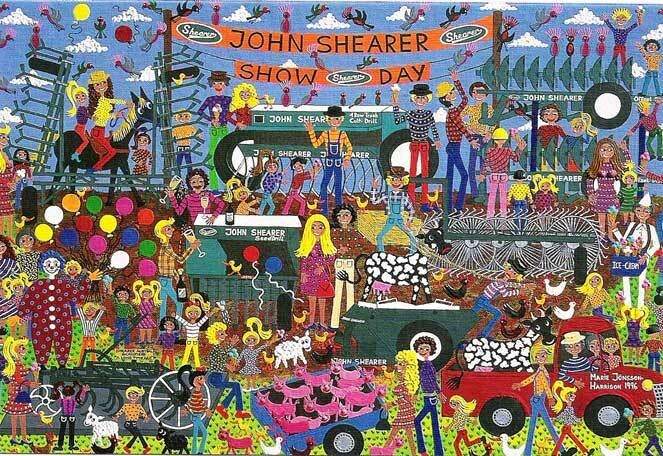 This acrylic on canvas painting is called John Shearer Show Day and was commissioned by them and hangs in their board room and has also been used for greeting cards and other promotional materials. John Shearer makes agricultural equipment as you can see from the artwork and here is a link to the newspaper story Elders Stock journal if you fancy a read (left hand side 6th story down). My husband has been to the show every year as he grew up in Adelaide and remembers attending as a child. At that time all the show bags (sample bags) were free and they would be laden down with all these bags full of all sorts of goodies; lollies, chocolates, biscuits and toys etc. He says that his brother came in very handy being in a wheelchair and the rest of the siblings would hang their show bags off the side of the chair so his brother Trevor could hardly be seen under them all. These days of course you have to pay for the show bags, a cheap one at $2 would be Bertie Beatle up to $30 for the fancier ones. However at the Melbourne show there was a showbag costing $999, called the Grand Ridge Brewery’s Beer Party Showbag, that one also included vouchers for 3 night’s accommodation with breakfast, dinner and other vouchers as well as a six-pack of beer. We as a family have gone there together since the kids were babes in arms, so the show is full of happy memories. The Yellow Brick Road was always a favorite, whereby you buy and empty bag and a map and then follow the directions all around the showground to collect your goodies at designated stands, some cookies here a bag of carrots there and yogurts and a loaf of bread etc. It used to be really good value for money and lots of fun. However this year it was mightily disappointing as some stands only gave us brochures, another 2 potatoes and one stand gave out one biscuit! If they think people will be lining up for that next year they are kidding themselves, lol. Of course there are plenty of rides and stalls, pig racing and dog and cat shows, wood chopping and the Grand Parade, precision driving, various horse events, singing and contortionists and lots of other things to do for free. My personal favorite has always been the Tasting Tent. I think that is a hangover from my modelling days in Tokyo where I used to love poking about in their big department store’s food halls and tasting all these weird Japanese concoctions. I think it is a habit that the whole family now enjoys and the kids have introduced to their friends as well. Hillivi’s boyfriend Brett is now quite good at wielding a toothpick and went hell for leather at the small-goods stand, shoveling in the salami and the like. They made me laugh with their tale at the Chilli stand where the hotness of the chilies was presented from 1-10 in degree of hotness as they ate their way through the numbers. Luckily for them the next stand had different fruit juices and they threw the samples down their throats whilst in between asking the lady ever so politely “What type of juice is this? etc, feigning an interest but really they were only after something to cool down their burning mouths. The juice lady turned out to be a sweetheart and kept up the supply of juice till they recovered. So I will finish this blog Some like it hot, with a quote by a movie star Gina Lollobrigida, which I think gives us all hope, lol.